Windows Search Service provides fast file searches on a server. 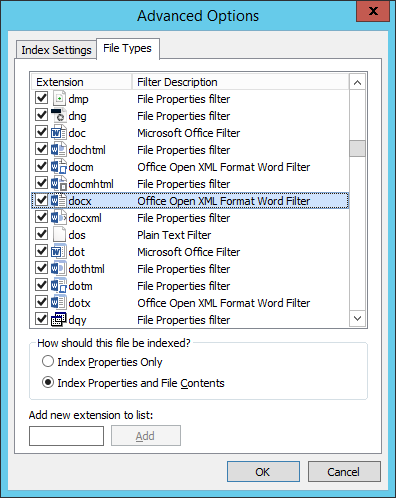 To make HTTP Commander use Windows Search service to search files and folder, follow steps below. Enable the Windows Search Service on the server that is hosting the HTTP Commander and on all the file servers, which network folders used as Shared folders in the HTTP Commander on Folders tab. For example, you installed HTTP Commander on a server A and configured it to use network folders from servers B (\\b\somefolder\) and C (\\C\anotherfolder\). You need enable Windows Search Service on all 3 servers: A, B and C.
By default, the Windows Search Service is enabled in Windows 7 SP1, 8, 8.1 and 10. However, you must manually enable it in Windows Servers: 2008 R2 SP1, 2012, 2012 R2, 2016, 2019. On the Installation Type page, select Role-based or Feature-based Installation, and then click Next. 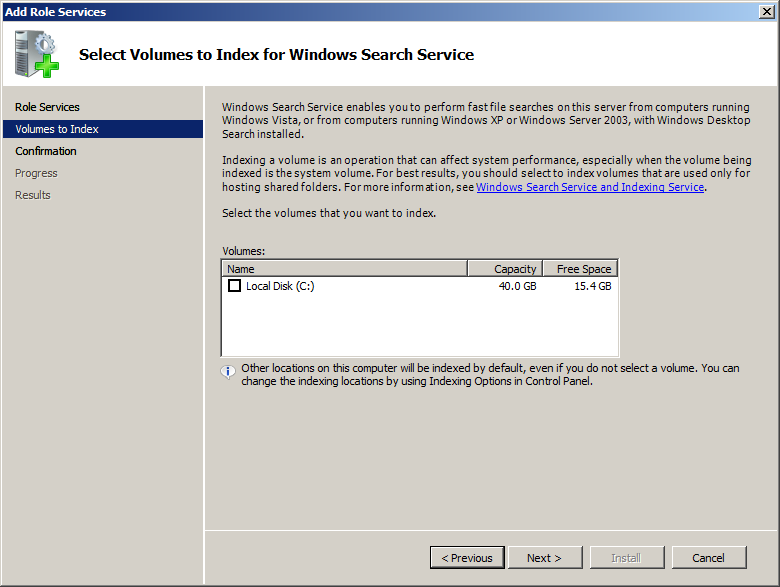 On the Features page, select Windows Search Service, and then click Next. On the Confirmation page, verify that Windows Search Service is listed, and then click Install. Start Server Manager. Click Roles in the left navigation pane. Click Add Roles in the Roles Summary pane. On the Server Roles page, select the File Services role, and then click Next. 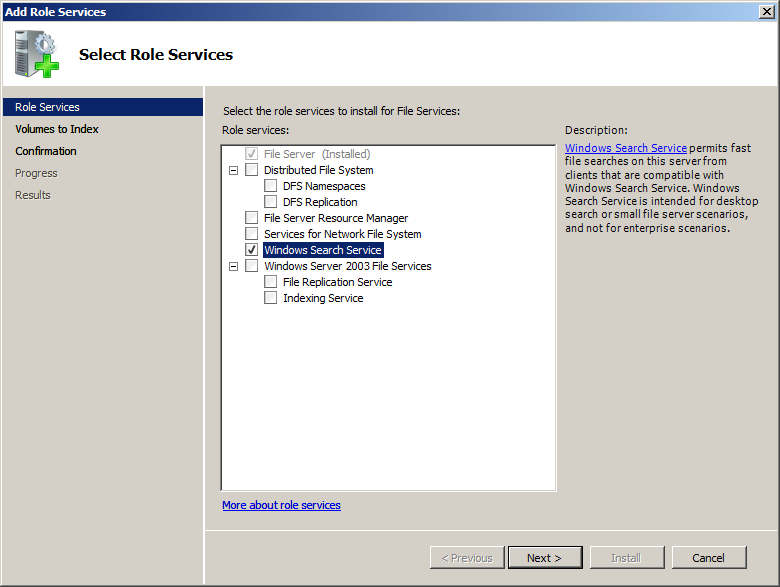 On the Role Services page, select the Windows Search Service role service, and then click Next. Note! 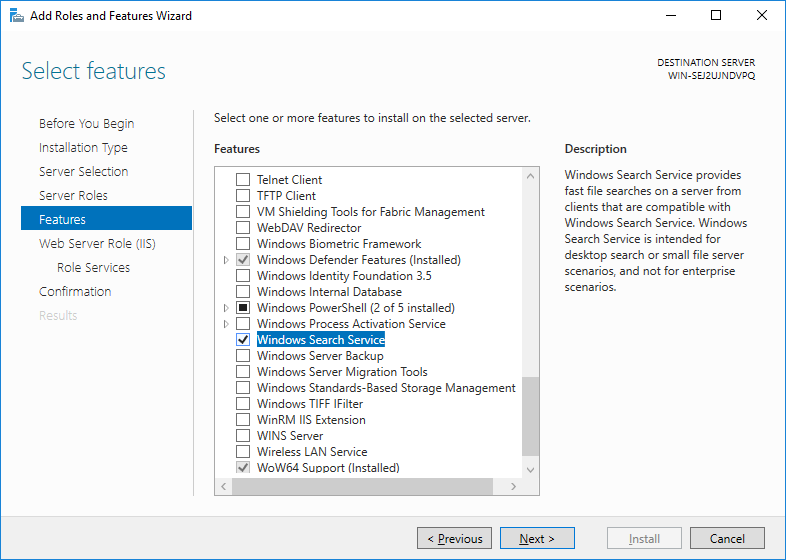 If the Windows Search Service is already installed on the server, make sure that the Windows Search service (Control Panel → Administrative Tools → Services) is running and startup type is Automatic or Automatic (Delayed Start). 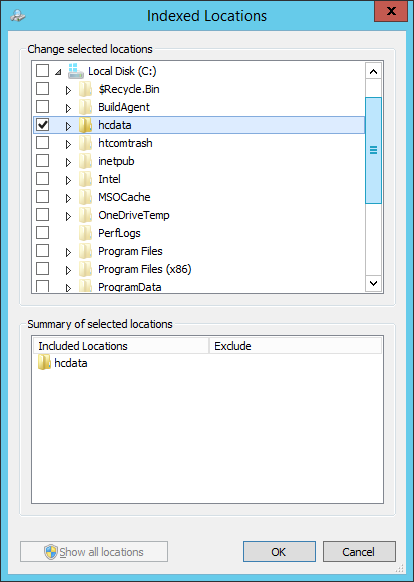 Next, you need add to the list of indexed locations each folder (physical path) used on the Folders tab (in admin panel). Depending on the type of folder : network or local, you need to carry on the server where corresponding folder is physically located . Add folder path to the list of indexed locations. (ie., for local folders it should be done on the server with HTTP Commander, for network folders(for example, \\server1\share), it should be done the remote server (server1)). Start Control Panel and click Indexing Options. Click Modify button in the Indexing Options window. 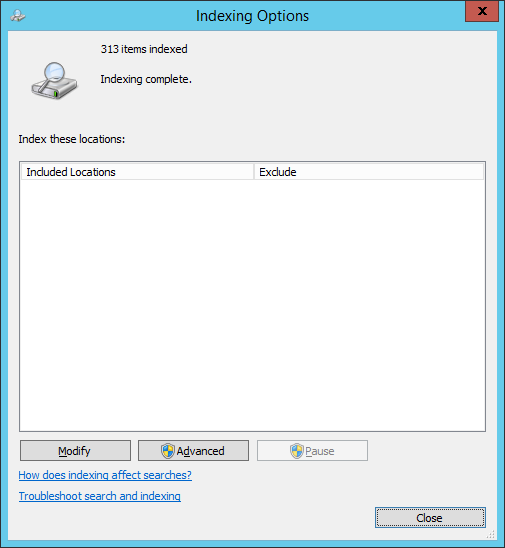 In the Change selected locations list (of the Indexed Locations window), locate and check the box, the physical path of the folder to be added. Next, click OK and Close buttons. Note 1. If in the physical path to the folder wildcards are used (such as %USERNAME%, %GROUPNAME%, %HOME%, etc. ), then it is necessary to add to the index all possible permutations of the physical path, or if these folders are in common parent folder, then it is enough to add only path to parent folder. Note 2. In the folder properties window on the Folders tab in admin panel, at lower right side of the physical path field there is the "Test indexing" link. By click on this link you can test if specified path is already added to the list of indexed locations or not. In case if the path is local, you can use this link to add folder to the list of indexed locations. Please note, that if the path contain wildcards, to the index will be added path with the current parameters of the logged in user. Also you can not add network folders to index using this link. Final step is configuration of HTTP Commander to use Windows Search Service to search files/folders. Set the value of the SearchMethodOfFiles parameter to the OnlyWindowsSearch or FirstTryWindowsSearchThanStandard (by default), click Save settings and than Restart application buttons in admin panel on Settings tab. If the value is set to OnlyWindowsSearch, then HTTP Commander will use only Windows Search Service to search files and folders. Please note, that in this case search would not work for non-indexed locations. If the value is set to the FirstTryWindowsSearchThanStandard, then HTTP Commander will try to use Windows Search Service firstly, and then if nothing is found, or found less than the expected value, the search is carried out by standard method (recursive listing subdirectories with a comparison pattern). For a more complete search it is recommended to use the value FirstTryWindowsSearchThanStandard, but it is possible that it is less productive, so depending on your folder settings, you can specify the value of OnlyWindowsSearch. If you enable the ability to search for files/folders (the parameter SearchMethodOfFiles is not equal to Disabled), then on the main page at the top right of the file list will be available quick search fields to search files by name (and, if available, by contents). 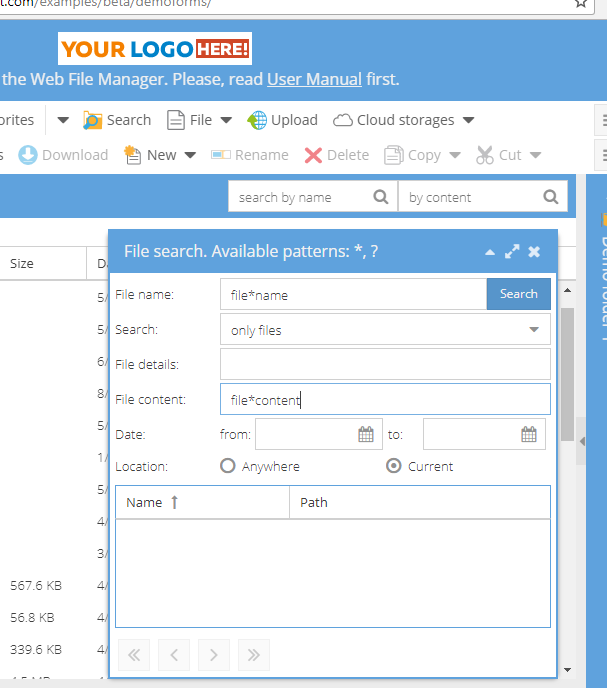 If you enter the value in the field and press ENTER (or the search button), it will automatically open a search box, fill the required fields, and will search for files. Also you can add a toolbar button Search (parameter ToolbarButtons1 or ToolbarButtons2; by defualt, Search button is included) to be able to open the search window from toolbar. Additionally, apart from the search by the filename, you can include a search by other file properties: the contents, dates of creation, modification. See parameter SearchCriterionsOfFiles. If the search criteria contain multiple properties (eg by name and by content), then all the conditions are united with 'AND' union, ie searched the files (and/or folders) that simultaneously satisfy all of the conditions (the name corresponds to the template and the content contains the specified string). 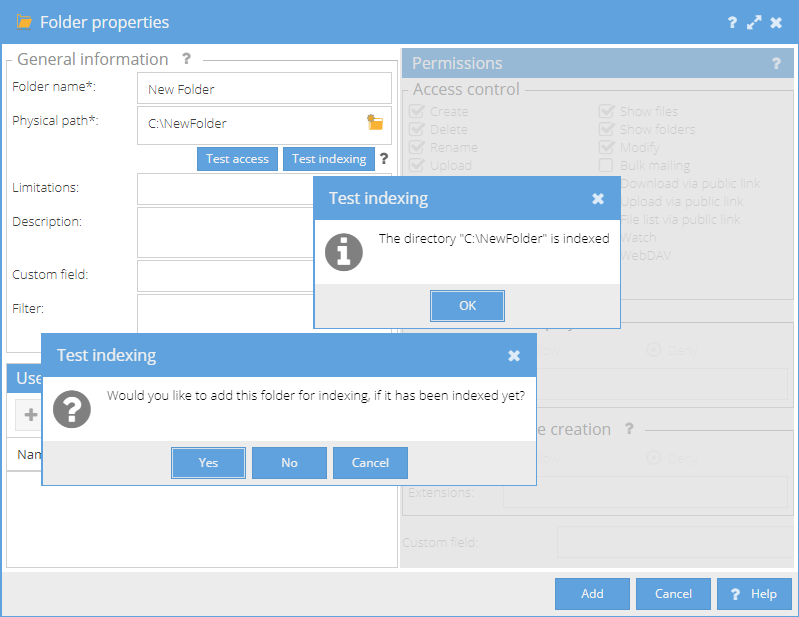 There is one exception: when the user has selected to search BOTH of files and folders at the same time, and specified condition to search by content - in this case a folders will be searched ONLY by the specified template name and files by the specified name and content. It may result, for example, to that ALL subfolders will be listed in search result, if the filename pattern is empty. It is recommended to check that the for required types of files (for example, Office documents: docx, xlsx, pptx or text files) content indexing is enabled. To do this open the Control Panel, navigate to Indexing Options, and then click the Advanced button. In the Advanced Options window, go to the File Types tab. In the list, select and enable needed extension, and mark option Index Properties and File Contents in the How should this file be indexed? box. If desired extension is not available, you can add it using the field below - Add new extension to list:. By default, this list of extensions already includes all registered extension, and content indexing is enabled for file types which is possible to index by content. Additionally, you can customize how the search the results will be shown on the page. You can change the value of hidden parameter MaxSearchResultsPerPage, specifying a value from 1 to 500 (default 20). 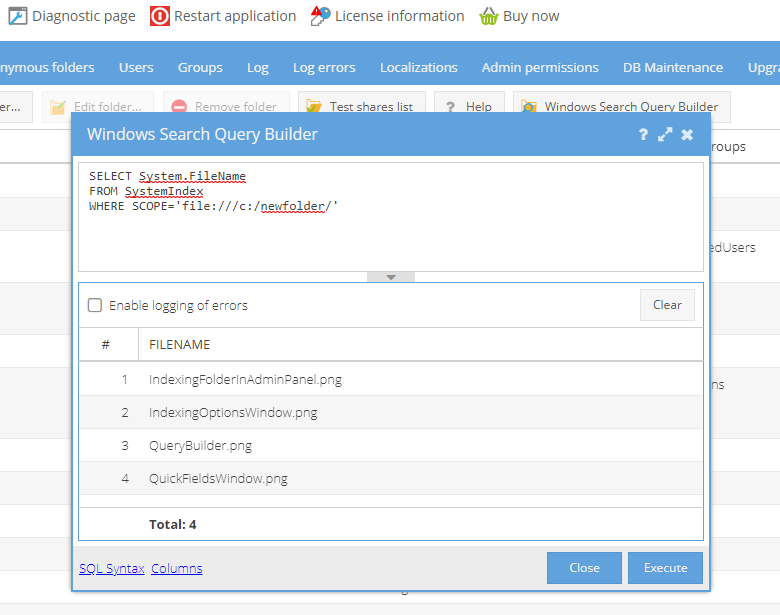 To test and validate SQL queries to the Windows Search Service (for example, caught in the error log), you can enable the hidden option EnableWindowsSearchQueryBuilder (only applies if used Windows Search in HTTP Commander). If this option is enabled, in the Folders tab of the admin panel, will be available button "Windows Search Query Builder" to call the Query Builder window. The search query by content, contained only ignored words. After successfull configuration of Windows Search Service and HTTP Commander you may notice that file of certain types are still not indexed, therefore it is not possible to perform full text search on them. These files types are XLSX, PPTX , OneNote and Publisher.